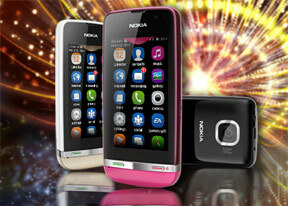 Series 40 has long been the main platform for Nokia - the Finns have sold literally billions of the S40 feature phones. The latest iteration, called Asha Touch, is the best S40 we've seen by quite some distance. It also does a much better job at transitioning from a D-pad operated to a touchscreen-only interface than Symbian did. The Asha Touch software takes a lot of design cues from its Symbian (or "Nokia OS" if you will) and MeeGo brothers, and as such the user interface structure is based on the MeeGo one. All interactions are touch-based, except for the red receiver key which is a handy way to bring out the homescreen or close an app. A swipe to the left will take you to the dialer. In fact, this screen can be customized to show either the music player or the radio but having the dialer always a swipe away is probably the most useful of the three. The third homescreen is what was previously known as Active Standby. It's now a pane to fill with shortcuts to frequently used apps or contacts. A tap and hold on that screen triggers Edit mode, so you can choose shortcuts and contacts to add. As usual, the time and date are displayed too, which in turn serve as shortcuts to the alarm app and the calendar. There are no other widgets available here unfortunately, e.g. a music player widget. The interface also uses transitions as it moves from screen to screen. On the decently powerful Nokia Asha 311 hardware, they are acceptably smooth and relatively nice to look at. Actually, the underpowered Asha 305 left us unimpressed, but Asha Touch on the 311 is a huge step forward. It's at least as fast, fluid and responsive as the entry level smartphones and although it lags occasionally, it's not too irritating. The MeeGo-inspired design makes sure all functions are easy to reach at all times. We don't even miss multitasking - the Asha 311 comes with all the essential functions as native apps, so they can receive notifications in the background, and the call/text/music functionality is always accessible. It's the most common use case - especially considering there aren't that many third-party apps to switch between (e.g. you're not going to use a third-party music player).